Three days ago, I crossed the finish line of my first half marathon. 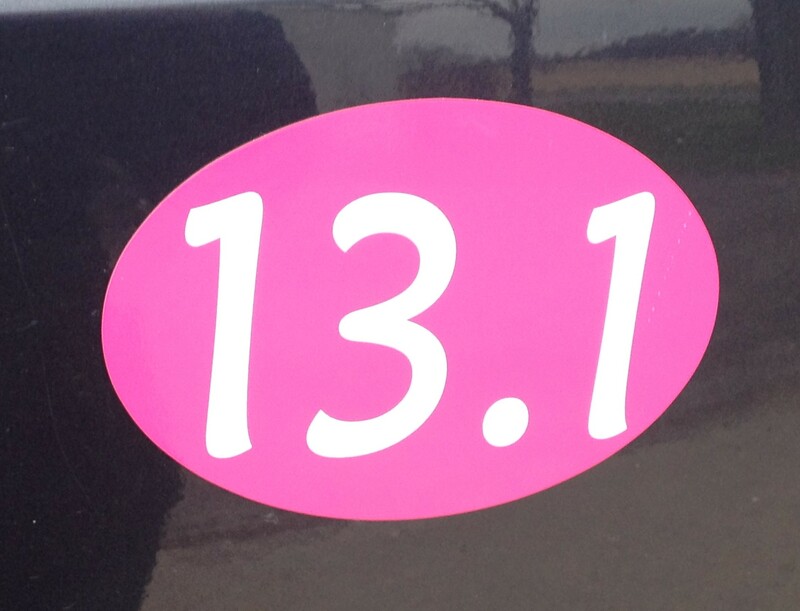 I ran 13.1 miles in 2:35:44 at the Glass City. 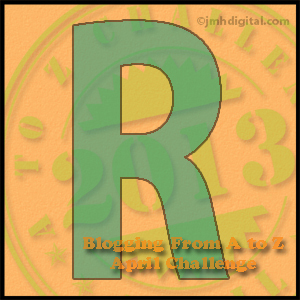 As I write this post, the feat is still surreal to me and almost unbelievable. 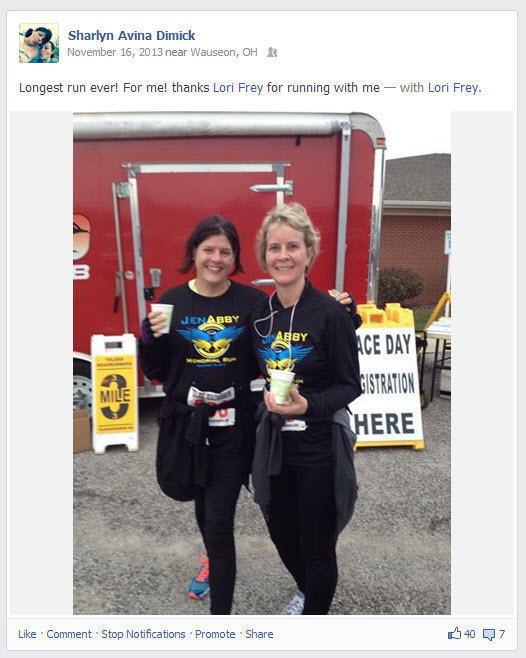 A year ago the idea of running a mile seemed impossible. 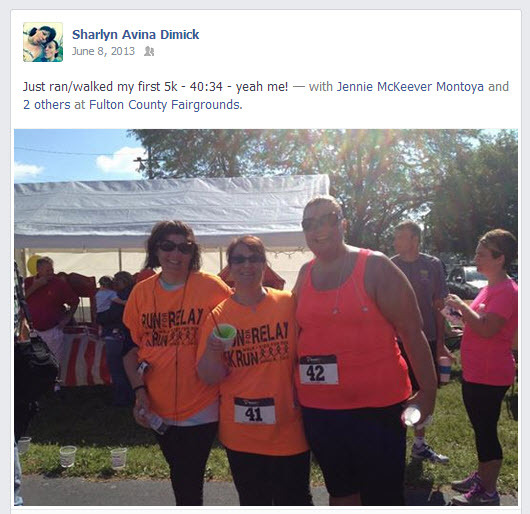 A 5k race was my goal and even that felt daunting and unattainable. A 10k was beyond my realm and a half marathon unthinkable. Yet, one by one I checked off each milestone. So is a full marathon on my horizon? No. Not because I don’t think I could do it, but more because it isn’t something I aspire to do. At this time in my life, I don’t have the time to dedicate to the time it would take to train for it. I am content with a half. I am finally able to say I am a runner without hesitation. 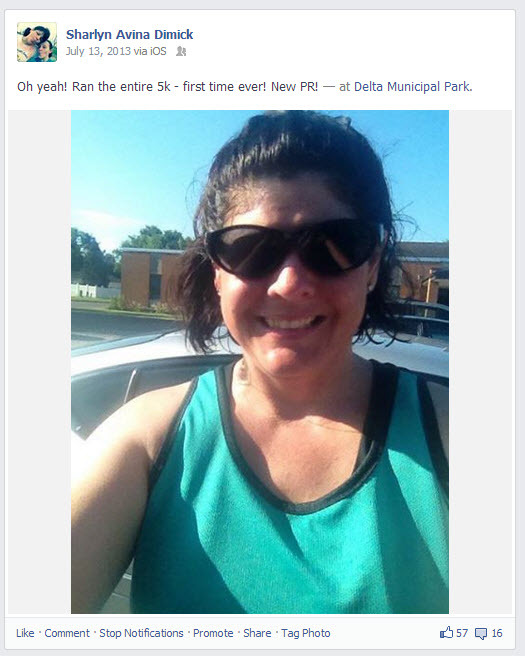 So for those of you starting out with the C25K or some other program – don’t give up! If I can do it, anyone can! 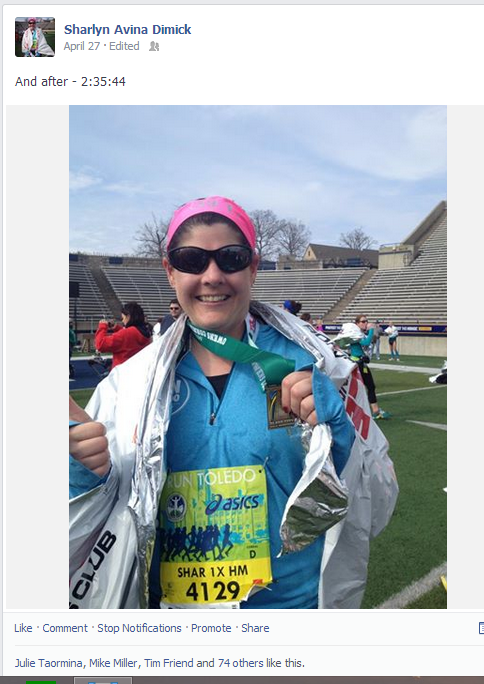 Posted on April 29, 2014 April 30, 2014 Categories life lessonsTags 10K, 5K, C2K5, Couch to 5K, fitness, glass city marathon, goals, half marathon, run, running2 Comments on I’m Finally A Runner! As a young girl I think I must have had an unnaturally high metabolism or something. I could eat whatever I wanted, thwarted exercise and never gained a pound well into my twenties. I wasn’t known as the prettiest or the smartest girl and never the most athletic one; but, I’d always been the thinnest and waifiest. Fast-forward two babies, fifteen plus years on antidepressants for anxiety/panic, years of emotional eating and hitting that brick wall of middle age, I’m far from the thinnest these days. And, I’m OK with that. Really. What I’m not OK with is the humbling fact that I weigh more now than at any other time in my life aside from the last months of pregnancy. I decided (and no, despite what some may think, I’m not having a midlife crisis even though I did get a tattoo and like listening to Taylor Swift and P!nk) I needed to do something about my dissatisfaction with myself. Thus, if you’ve been following along this blog of mine, you know I’ve been on a quest to “get fit” lately. I realize I didn’t put on these extra pounds overnight and they aren’t magically going to fall off after a few months of walking/running and counting calories (although I admit I still devour those articles where women seemingly lose 30 pounds in 30 days by following one simple rule…) Even though I’m not a skinny-mini anymore and never will be again, I am feeling better, stronger and more energetic. Which, is the whole point, right? (yes, I am still trying to convince myself of that!) And so, I thought I’d share a few of the lessons I’ve learned thus far. Lesson #1: Do NOT take any children under the age of ten on your walking/running workouts unless they can still fit in a stroller. As I started my couch to 5K journey, my girls begged to come along. Great, I thought, I can get in some fitness activity and spend quality time with the girls. I failed to consider that the six-year-old stops every five steps or so to pick flowers or tie her shoe. I also failed to consider that her feet would hurt after 10 minutes or the fact that as we were jogging along she would stop dead in front of me causing me to trip and fall, knocking her over, landing in a heap in the middle of the road. With blood dripping from both our knees I limped back home with her on my back. While I still take her on short walks some days, I now know I won’t be getting an actual workout and plan to do so after. Lesson #2: Check the radar before you leave unless you don’t mind getting wet. So far I’ve gotten completely drenched three times this summer. No drought this year, that’s for sure. Another tip is that if there are dark clouds in the sky when you step out the door, you’ll probably get wet. I thought our weather came from the west and I’d be safe if the clouds were north, south or east of me – not so. The weather is hot, though, so the rain actually felt pretty good. However, when the thunder started rumbling and I was still a mile away from shelter, I must admit I got a bit worried. Fortunately for me, I made it home without getting struck by lightening. Lesson #3: Use your gadgets, but don’t rely on then. I am the queen of gadgets and cool iPhone apps. I have several that I really like right now…Lose It, Up, and Run Keeper. I like to track my progress and look back over my logs. It makes me feel good to see how far I’ve come since I started in March. However, as soon as you become obsessed with the tracking – the app will crash or your cell phone will die and you’ll lose your data. When this happened to me (multiple times!) it was really discouraging, but luckily I didn’t let it derail me. Try, try again. Lesson #4: Sign up for a 5K (or two or three) as a runner. 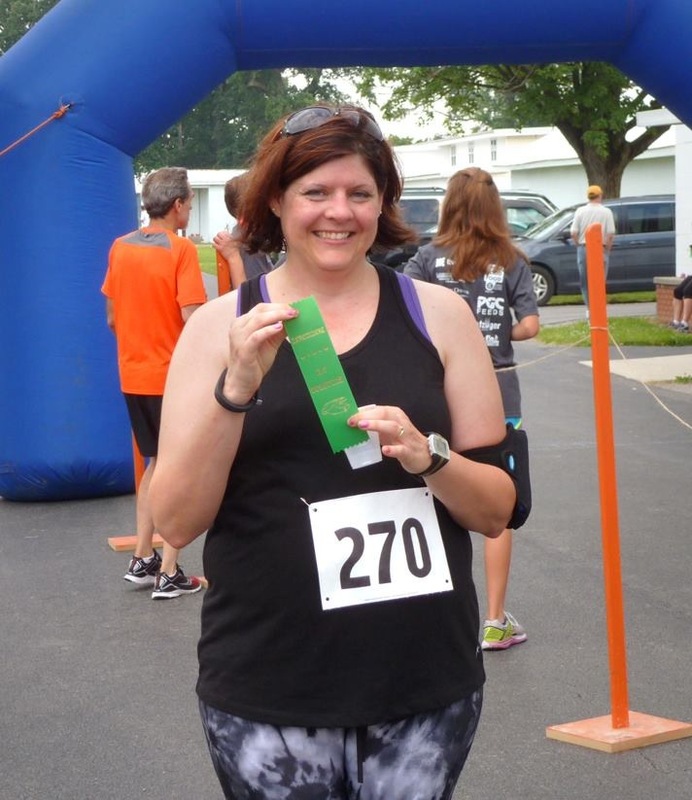 I used to think in order to sign up as a runner in a 5K, that I actually had to, well, run it (go figure!). As I talked to some of my running friends, I was enlightened. If you sign up as a walker, you aren’t allowed to run, but the reverse is not true. You don’t have to be able to run the whole thing to sign up as a runner. Weird that this had never occurred to me before. So far, I’ve ran/walked in three 5Ks. I’ve yet to run the entire distance, but each time I’m a little closer. I’m signed up for three more throughout the summer. This is probably the best thing I’ve done to keep me going as it gives something to work toward as I progress toward fitness. Does anyone have any “get fit” lessons they want to share? Does anyone remember that asinine game, called Red Rover? It seemed all my gym teachers loved to torture us, I mean, force us, I mean, let us play this game as a special “treat.” Oh sure, some kids that got all excited and couldn’t wait to play. Me, not so much. And to up the fun even more, the teacher couldn’t just let us count off to get the two teams, she had to do the whole “captain” thing. Inevitably I’d be picked last or close to it, which really didn’t bother me all that much, as I was hoping not to be picked at all. Once the teams assembled, I tried to get on the end of the line. Being the skinny, geeky kid, the other side always ran toward my arms. At first I’d try to hold tight so the opposing runner couldn’t break through my arms, but quickly realized it was better to just let go and avoid getting my arm broken. And in the off-chance, the other team actually chanted, “Red Rover, Red Rover send ‘Shar’ right over,” dread filled me as I ran over and get stopped every time:( I wonder who even made that dumb game up. My daughter tells me they still play this disturbing game at her school too. Luckily she’s a bit more athletic than I am. Why, I have no idea. It’s not even remotely fun. Next to math, phys ed was my least favorite subject. Maybe if I’d put more effort into it back then, I’d be better at exercising now, though. I mean I want to look good and be healthy, but when I try to exercise, something always thwarts my attempts. Recently I started a running program (those that know me can stop laughing now). I got this app called the Couch to 5K. You alternate walking and running until you can run 5 kilometers. I downloaded it to my iPhone. It’s really pretty sweet in that it tracks your route, speed and tells you when to walk, when to jog and most importantly when to stop!